This simple proverb speaks of how one person can effect another. It emphasizes the positive shaping ability one person can have on the character of another. We can sharpen others, and they can sharpen us. We can make this positive impact on others through the example we set for others. When we see a friend struggling to persevere in his studies, we can encourage him to trust God and work hard. When we see a friend deceive her parents, we can encourage her to tell the truth even when it hurts. When we see a friend waiver in his faith, we can remind him about the character of God and share a verse from scripture. When we see a friend wrestle with obedience to God’s ways, we can encourage her to obey God. We can also look for godly, mature people to sharpen us. It takes humility to admit we need sharpening, but an honest reflection of our lives reveals we get dull, and we need the sharpening effect of a godly influence. We can get plugged into our youth group to be sharpened by our youth leader. We can join a Bible study to be sharpened by individuals in the group. And if we have Christian parents, we can be sharpened by their example and advice. 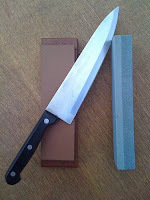 Who are you sharpening? Who sharpens you?